Objectives: The objectives of the present investigation were to prepare recombinant human insulin entrapped Eudragit-S100 microspheres containing protease inhibitors and to precisely analyze the outcome of different formulation variables on the microspheres properties using a response surface methodology to develop an optimized formulation with desirable features. Methods: A central composite design was employed to produce microspheres of therapeutic protein by w/o/w multiple emulsion solvent evaporation technique using Eudragit S-100 as coating material and polyvinyl alcohol as a stabilizer. The effect of formulation variables (independent variables) that is levels of Eudragit S-100 (X1), therapeutic protein (X2), volumes of inner aqueous phase (X3) and external aqueous phase (X4) on dependant variables, that are encapsulation efficiency (Y1), drug release at pH 1.2 after 2 h (Y2) and drug release at pH 7.4 after of 2 h (Y3) were evaluated. Results: The significant terms in the mathematical models were generated for each response parameter using multiple linear regression analysis and analysis of variance. All the formulation variables except the volume of external aqueous phase (X4) exerted a significant effect (P <0.05) on drug encapsulation efficiency (Y1) whereas first two variables, namely the levels of Eudragit S-100 (X1) and therapeutic protein (X2) materialized as the determining factors which significantly influenced drug release at pH 1.2 after 2 h (Y2) and drug release at pH 7.4 after of 2 h (Y3). The formulation was numerically optimized by framing the constraints on the dependent and independent variables using the desirability approach. The experimental values for Y1 and Y2 of optimized formulation were found to be 77.65% and 3.64%, respectively which were quite closer to results suggested by software. Conclusion: The results recorded indicate that the recombinant human insulin loaded Eudragit S-100 microspheres containing aprotinin have the benefits of higher loading efficiency, pH responsive and prolonged release characteristics, which may help to carry insulin to the optimum site of absorption. Keywords: Recombinant human Insulin, w/o/w multiple emulsion, Eudragit S-100, microspheres, response surface methodology, central composite design. Keywords:Recombinant human Insulin, w/o/w multiple emulsion, Eudragit S-100, microspheres, response surface methodology, central composite design. 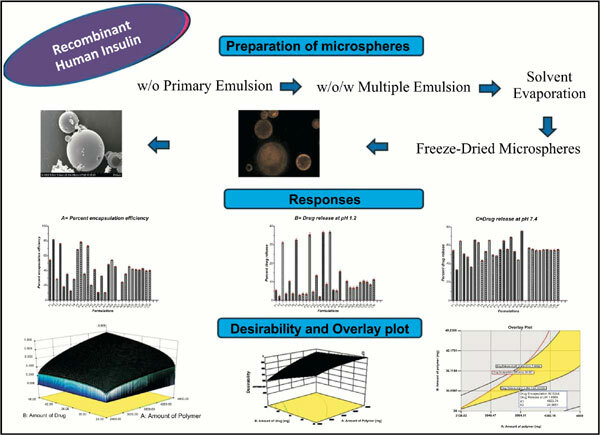 Abstract:Objectives: The objectives of the present investigation were to prepare recombinant human insulin entrapped Eudragit-S100 microspheres containing protease inhibitors and to precisely analyze the outcome of different formulation variables on the microspheres properties using a response surface methodology to develop an optimized formulation with desirable features. Use of Thiazolidinediones and Risk of Bladder Cancer: Disease or Drugs? β3-Adrenergic Receptors: Really Relevant Targets for Anti-Obesity Drugs?